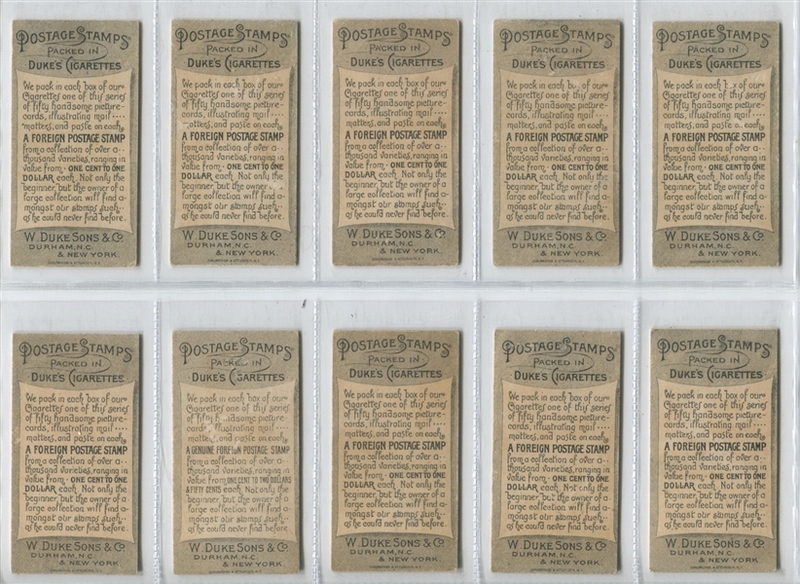 The N85 Duke Tobacco Postage Stamps set is a unique set issued by Duke in the late 1880's. The card stock pictures spaces where stamps of the day have been glued in place. 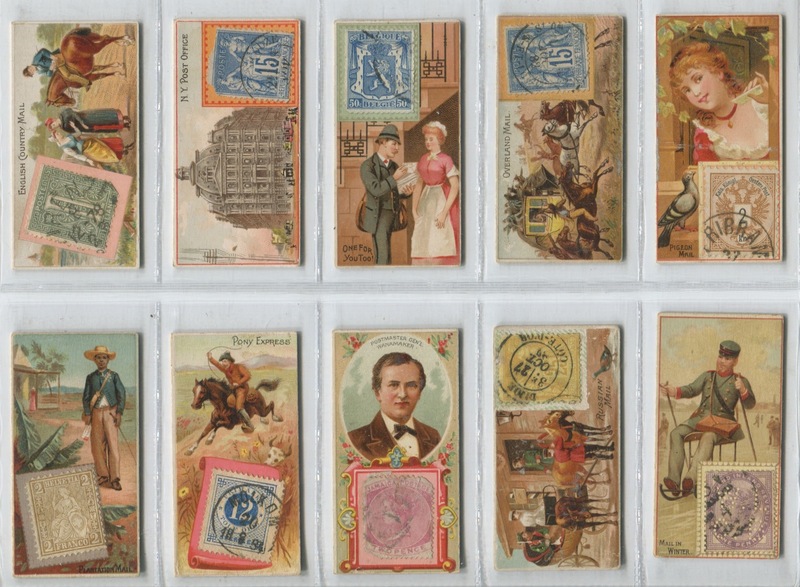 The subjects in the set are related to mail delivery all over the world and the stamps that are affixed are from all over the world from the period during which the cards were issued. 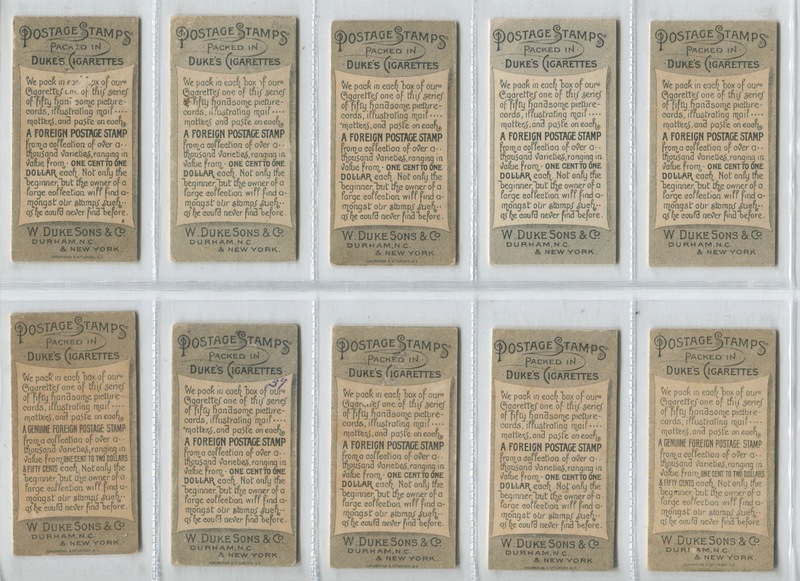 This is the only U.S. regular issued set that has postage stamps affixed. 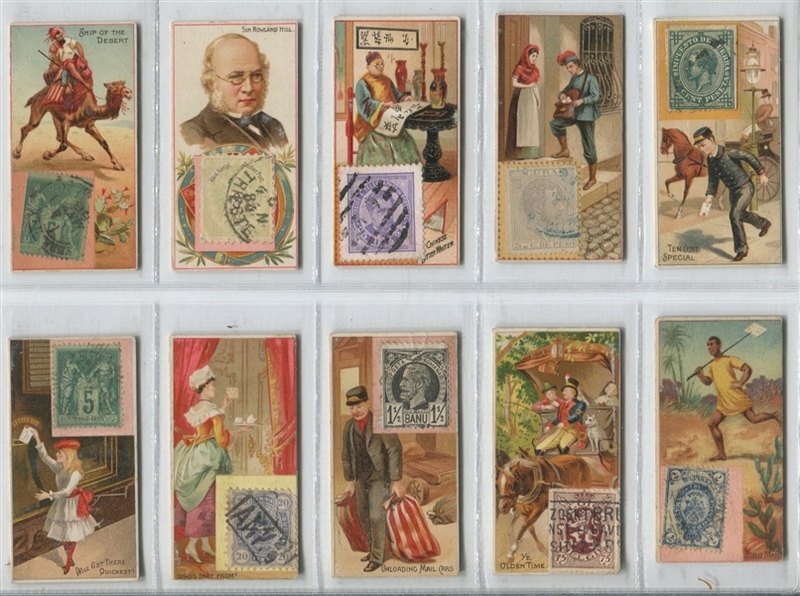 American Tobacco Company issued the T404 set of Columbian Exposition and other stamps for use abroad during the turn of the century. 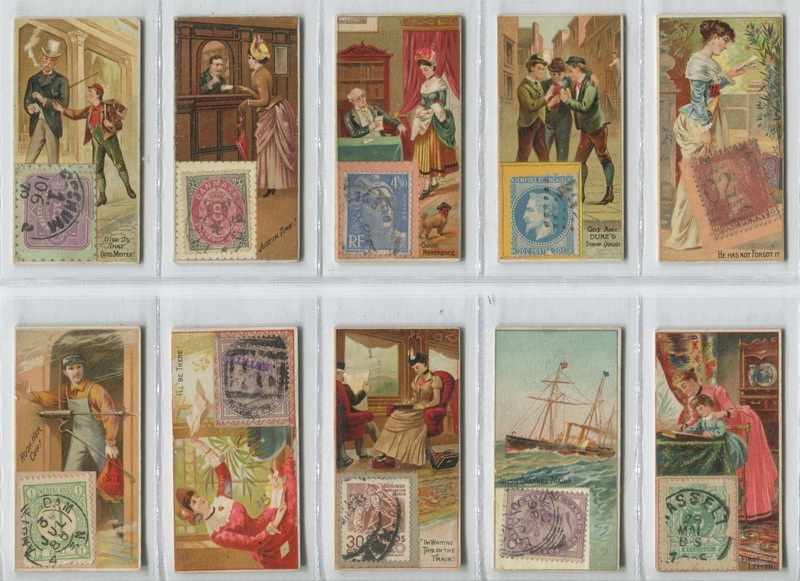 The set was issued during the "Tobacco War" years where the U.S. and Britain were building entities to control cigarette manufacturing and distribution. The first stamps to be used widely by a sovereign nation were used in the United Kingdom in 1840. The Penny Black started the tradition of the UK stamps having the monarch on them with Queen Victoria's likeness. 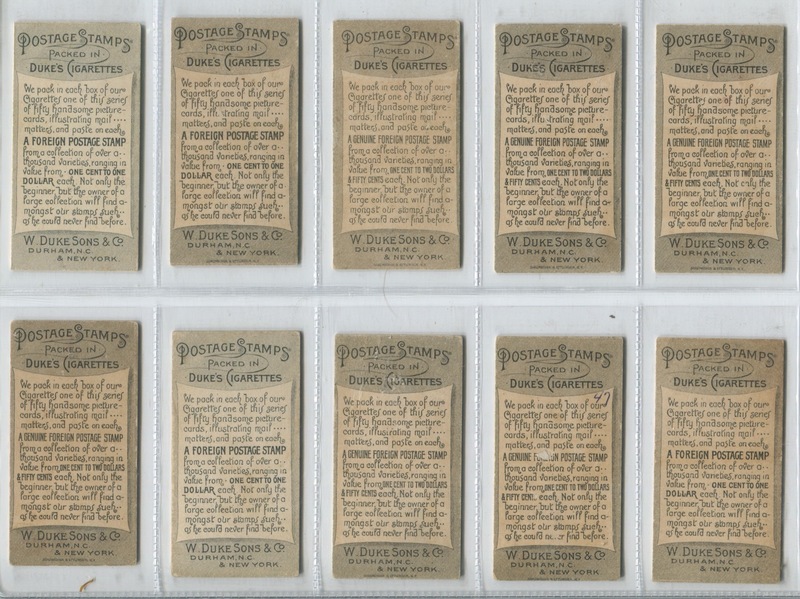 The United States first began widespread official postage stamp usage in 1847 with the issuance of 5 cent Benjamin Franklin and 10 cent George Washington stamps. Other than two subjects, the titles of the cards in the N85 set are generic titles such as "Just in Time" and "Irish Channel Mail". The two non-generic subjects are Sir Rowland Hill and U.S. Postmaster General John Wannamaker. Sir Rowland Hill is largely credited with creating the current postal system of stamps and prepayment of letters being sent. 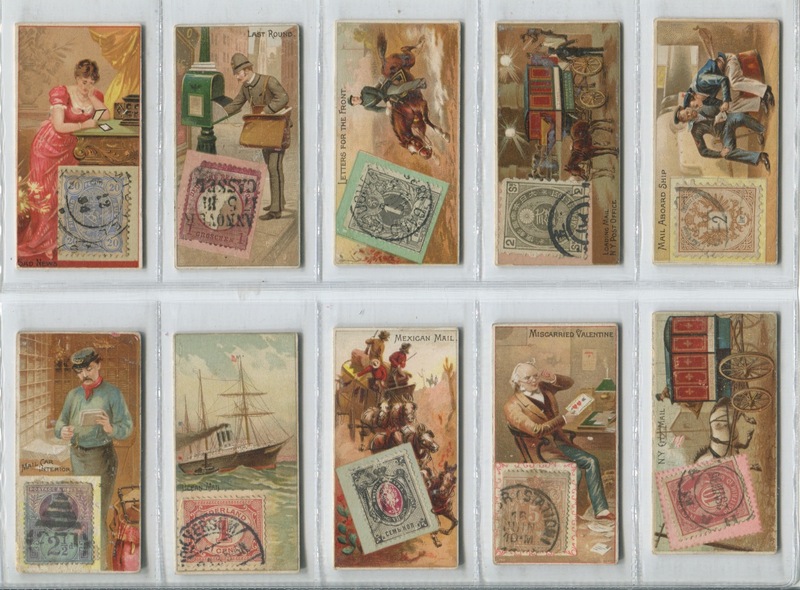 In 1889, President Benjamin Harrison appointed Wannamaker as Postmaster General. 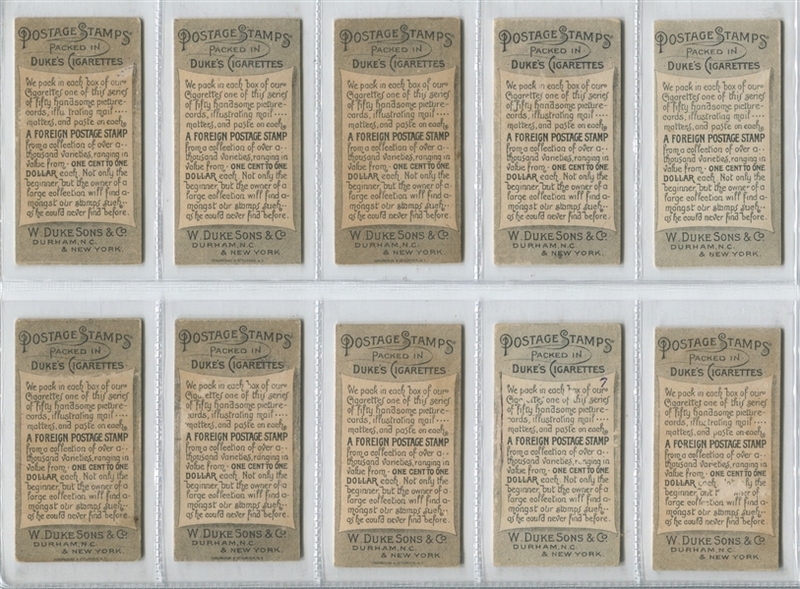 Wannamaker is often credited with creating the first commemorative stamp. 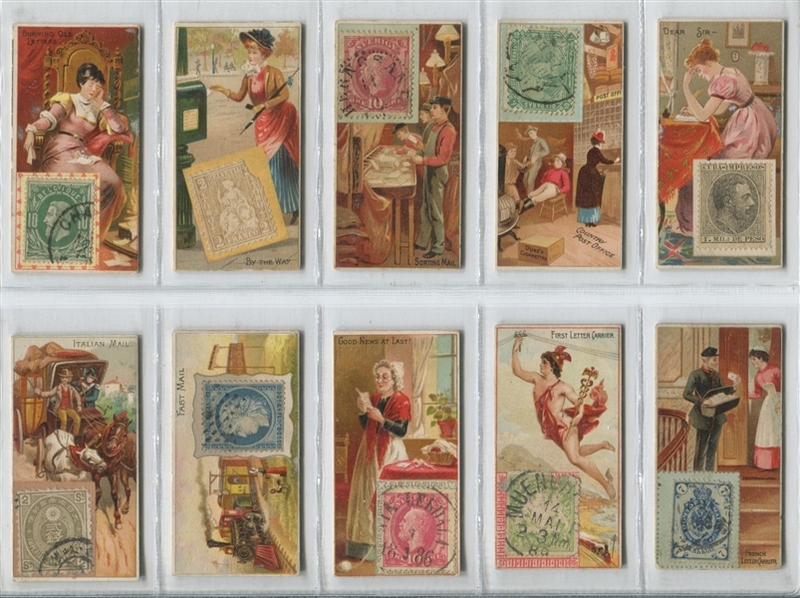 The set composition of the set is as follows: There are 12 cards with the text "Genuine Foreign Stamp" on the back, 38 with "Foreign Stamp". Of the 50 cards in this set, 35/50 have the lithographer tagline on the back at the bottom of the card. This is a good set for master set collectors to collect with the back varieties it offers. 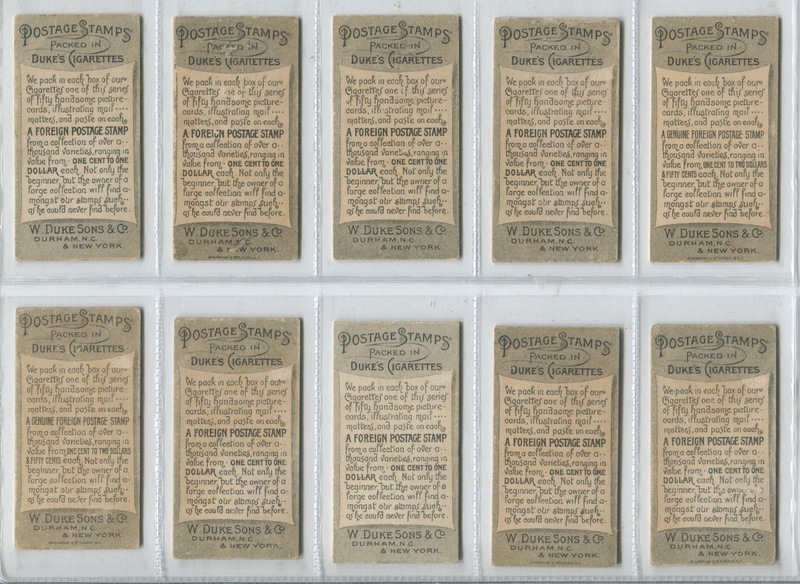 Condition breakdown on the set is as follows: VGEX to EX condition (20 cards), VG to VG+ condition (16 cards) and GVG or less (14 cards). There are about 10 cards that have a number in ink written on the back or have had that number erased from the back. All cards in the set present relatively well and this is a set that is about mid-range condition. With a few upgrades this could be a solid mid range condition set.